Our trip on the Blue Ridge Parkway. I filled out our online form for the Blue Ridge Parkway Foundation “End-to-Enders” program when we got back home from the trip. Well, today we got a package in the mail from them including our certificate, stickers, magazine and pins. Pretty cool stuff! Well as I had promised you can now see pictures from our Blue Ridge Parkway trip. Most of them are scenic shots so you won’t have to look at me too much! I’ve uploaded all the pictures to SkyDrive. This will allow you to see the entire series of photographs in thumbnail or scroll through them. I haven’t added captions yet. Donna took a lot of these pictures from the back of the motorcycle while going down the road. I also played around with Windows Live Movie Maker and made a DVD slide show of some of the pictures (not all) set to music. I also uploaded the video to You Tube in case anyone is interested in looked at the serenity of the slide show. You can click on the “You Tube” icon near the lower right of the view screen if you want to view it in a slightly larger format. I would not switch to “full screen” as the images get jagged edges and lose some of their clarity. This was my first time using Movie Maker to make a DVD. Thanks for viewing and we hope you enjoy watching as we like sharing this experience. Warning, this may be long as it’s the summary of the trip! Back in the late spring or earlier summer before I retired from the police department we began talking about a motorcycle vacation. Now we had taken trips and even vacations on the motorcycle before. But, they were usually overnight or riding a full day and staying somewhere for a few days or a week. This would be our first motorcycle trip where we’d be on the road everyday for a week. We chose the Blue Ridge Parkway as our destination. We took that trip from September 20 – 26, 2011. Our plan was to ride up to mile marker zero in Waynesboro, VA, then take the parkway south to mile marker 469 in Cherokee, NC and then head back home to the Atlanta, GA area. Our trip to the top would intentionally not use the Blue Ridge Parkway. We’re not campers so our whole trip would be spent in hotels or lodges. I know camping is part of the adventure but on a BMW K1200LT there’s not any room to lash camping gear along with other supplies needed for two people for a week. The R1200GSA has a distinct advantage there. Besides, the “LT” stands for “Luxury Touring” doesn’t it? Our planning must’ve been pretty good because as of now I can’t think of any negatives about the trip or hardships, other than we both got colds along the way. We made hotel or lodge reservations ahead of time for every night. In the fall, places along or near the Blue Ridge Parkway can fill up quickly. Even though the parkway is 469 miles we planned a leisurely trip that would take us nearly 5 riding days so we could take our time and stop and enjoy the sites. We also planned a two day stop along the way in Little Switzerland, NC to kick back and take it easy for a day. The maximum speed limit on the Blue Ridge Parkway is 45 mph and it is lower in some parts. 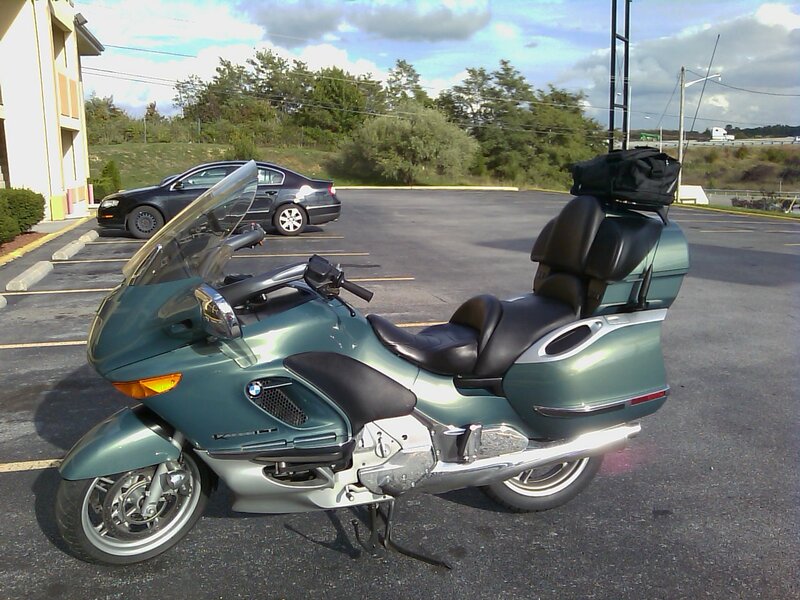 If you don’t have any luggage made to fit the saddlebags/sidecases or trunk/top case of your motorcycle, get them. We did for this trip. We got the ones specifically designed for the BMW K1200LT from Bestem USA. The bags are designed to fit in the cases precisely, you just stuff them, zip them and put them in the motorcycle. They hold an amazing amount of clothing and supplies this way, enough for the two of us for a week with room to spare. When you stop for the night, you just take the bag out and take it in with you, no loose items. Bring a first aid kit and tool kit. We didn’t need them but were prepared. Be prepared for any kind of weather. This time of year on the Blue Ridge Parkway you need to be prepared for temperatures from the 40’s to near 80, clouds or sun and fog or thunderstorms. We packed the insulated liners for our jackets but didn’t need them. Wear quality riding apparel. I’m sorry, but leather just doesn’t cut it anymore. I wear a Fieldsheer jacket and Donna wears a Cortech LRX. Both jackets have removable insulated liners, vents and (more importantly this trip) also have a Rainguard liner. For riding we both had armored Tourmaster pants with Rainguard liners and armored riding jeans. I’d rather be dry and riding in 35 temperatures than be wet and riding in 70 degree temperatures. Service your motorcycle before the trip. There are no commercial businesses or gas available on the Blue Ridge Parkway (no commercial vehicles are permitted either) but lodging, food and gas is available not far from the parkway at intersections with state or U.S. highways so plan your gas stops accordingly. There are three lodges operated on the parkway by the U.S. Park Service along the way. Two are actual lodges with restaurants and one is rustic cabins. Our route to the Blue Ridge Parkway used a combination of state, U.S. and interstate highways. Let’s face it the interstate can be boring on a motorcycle. We went up I-575 until it became Ga HWY 515 all the way to Hiawassee. From there it was U.S. 64 to U.S. 23/441 (The Great Smoky Mountain Expressway). Just outside of Asheville, NC we got on Interstate 40 and used various interstates to go to Christiansburg, VA where we spent our first night. The next day we got up and rode the next hour and a half to beginning of the Blue Ridge Parkway. We had rain for the first part or our trip (remember the quality apparel?) and ended with partly sunny skies. Day one was a travel day from home to Christiansburg, VA. We did have rain but were prepared for it. Temperatures went from the low 60’s to the low 70’s. Near Waynesville, NC we had a crow fly into the motorcycle as it took off at the last minute from something it had in the road. No loss of control, no injuries and no damage. I’m not so sure about the crow though. The second day was rain and fog nearly all day. Temperatures the entire day were in the mid and upper 60’s. We had an hour and half ride to the beginning of Blue Ridge Parkway. The closer we got to the parkway, the foggier it got in the last few miles. We were headed to the Peaks of Otter Lodge on the parkway that was located at mile marker 86. 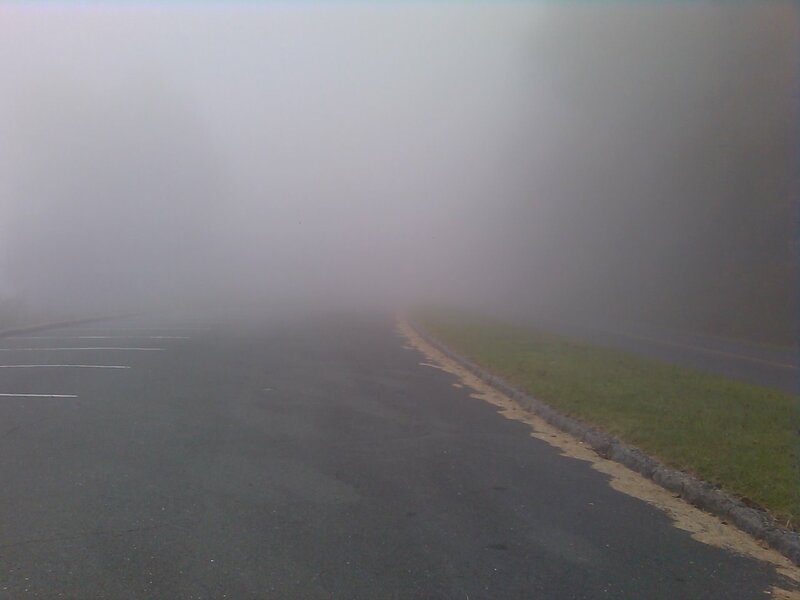 The fog on some parts of the Blue Ridge Parkway was so dense you really couldn’t see far down the road so it was slow going at times. Donna even saw a coyote standing on the side of the road watching us go by. The Peaks of Otter was a very nice and quiet place. All the rooms overlook the lake and also have screen doors on the front as well as your patio or balcony. As foggy as it was when we got there we still had some amazing views. The lodge comes right out and tells you on the website that there are no televisions or phones in the rooms and the area also has no cell phone coverage. Know what? For that night we didn’t miss them at all. Day three gave us brightening skies so we were able to get by wearing our armored jeans instead of the Tourmaster pants. However temperatures all day stayed in the low to mid 60’s. This day would also be taking us from the Peaks of Otter to our off parkway stay in Hillsville, VA at mile marker 200. We did have a bit of fog and some of the scenic overlooks showed us the clouds below us. It was also on this part of the journey that we found how narrow the right of way for the Blue Ridge Parkway can be. Near Roanoke I was able to see a Wal-Mart from the parkway and there was at least one subdivision that had backyards that backed right up to the Blue Ridge Parkway. When we got the hotel to check in, there was couple ahead of us from Ohio and they were each on their own BMW R1200R Roadster. They had also been on their own journey to the south and were now headed home travelling north on the Blue Ridge Parkway while we were travelling south. Day four gave us a steady rain for a good portion of our journey from Hillsville to Little Switzerland, NC at mile marker 330. The rain and fog combined with higher altitudes kept temperatures in the low and mid 60’s. Little Switzerland was also our planned stay of two nights at the Big Lynn Lodge. The Big Lynn Lodge has been in operation since 1930 and the original building is still in use for guests. 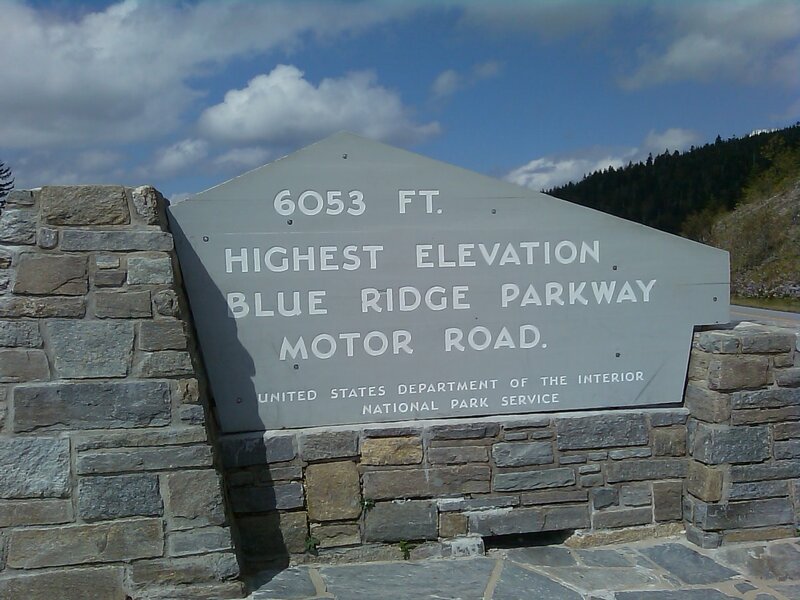 Remember, the Blue Ridge Parkway was begun in 1935. Your stay at Big Lynn includes breakfast and dinner for two people in the cost of your room or cottage. It’s a really comfortable, friendly atmosphere. They even ring an old train bell when they begin serving breakfast and dinner. Our room overlooked the Blue Ridge Parkway which was about 75 feet away and amazingly quiet at night. The other side of the property overlooked the mountains and valley. It was good that we built in a restful stay at a place like that. We even just sat on the porch and watched the parkway traffic go by. While in Little Switzerland we also rode “The Diamondback“, a road of some very tight descending curves into the valley. Once in North Carolina we could notice that the leaves had more fall colors in them than in Virginia. This might confuse you since we’re further south but the higher altitudes in North Carolina mean cooler nighttime temperatures that contribute to the color change. This was our day to travel from Little Switzerland to Maggie Valley, NC down at mile marker 455. Yes we know, that would leave only 14 miles of the Blue Ridge Parkway for the next day. But we both knew that we would’ve been tempted to continue on home if we did that. Why push ourselves? Overnight we had really bad thunderstorms in Little Switzerland. The storms were so bad the Asheville television station was talking about them on the morning news and showing how they stayed in one spot and dumped a lot of rain. Overnight rain in the mountains means morning fog. There was a lot of dense morning fog. The fog was thick enough that you could feel it in the air and it was dripping off objects. This meant another day in the gear that would keep us dry. Again we started out with temperatures in the low 60’s but when we got to Maggie Valley it had warmed into the 70’s! Along the way the Linn Cove Viaduct appeared and then disappeared back into the fog. It came upon us so quick, we couldn’t stop and take the signature picture of it. We did stop at the viaduct visitor center and went up the walkway under the viaduct. Donna carries the camera in her pocket and did take some great pictures of the viaduct while we were on it. By the time we got to Mt. Pisgah and then the highest point on the parkway we were looking at mostly sunny skies. Then it was downhill, literally, into Maggie Valley. The further south we travelled into North Carolina, the more the trees were changing to their fall colors. This was our last day on the road. We finally had good weather in the morning! And the weather stayed good all day. We knocked out the last 14 miles of the Blue Ridge Parkway to Cherokee, NC. The parkway kind of unceremoniously ends at U.S. 441 in Cherokee. There’s no sign, nothing that the Blue Ridge Parkway is ending. You just stop and have to turn right or left. We headed through Cherokee and then into the Nantahala Valley heading for home. In Murphy, NC we started getting our only little bumps in the road for our trip. It got very windy with gusting winds across the highway. The gusting winds kept opening the mic on Donna’s headset, giving me nothing but wind in my ears. With the Scala Rider headset, you can’t hear yourself in your own headset like we could with the wired BMW intercom. She wasn’t hearing the wind and I was so it was her mic. The windshield protects me more from the louder noises that would trip the mic. Then in Ellijay, GA while at lunch we had come out and I had a message on the GPS that the Bluetooth connection to the Scala Rider had been disconnected. I tried to re-connect and it wouldn’t. I disabled Bluetooth on the GPS and then it wouldn’t initialize Bluetooth at all. It really wasn’t a big deal as we were now in very familiar territory and I didn’t need the GPS anyway anymore. When we got home, everything magically worked again. We got home even before the school busses started dropping off kids! We’ve ridden more than 469 miles in a day a number of times. But this was different. Not only was the maximum speed limit on the Blue Ridge Parkway 45 mph but we wanted to take a leisurely trip and stop whenever we wanted. The only thing we had to do was make it to our next destination for the night. By planning our stops where I did, we were arriving at most stops around 3:00 pm. The BMW K1200LT ran like the finely over-engineered piece of German engineering it was meant to. What used to be referred to as the “Big K bike” (there are now bigger K bikes) actually surprised us. Over the course of the entire trip of 1,349 miles she averaged 45.5 mpg according to the trip computer! That mileage was with 2 adults and all our gear and at interstate speeds of 70+ mph the Big German Lady really starts drinking down the premium unleaded. She now sits in the garage with 61, 324 miles on her odometer waiting to take us on our next adventure. Along the way on the Blue Ridge Parkway we saw some magnificent scenery, coyote, deer and lots of wild turkeys. We spoke with other motorcyclists, travellers and hosts. Everyone seemed interested that we were riding end to end. It is simply an amazing trip by motorcycle as you are immersed in the view. When you ride the parkway you can’t help but think of how they managed to build the road in that terrain when they built it. 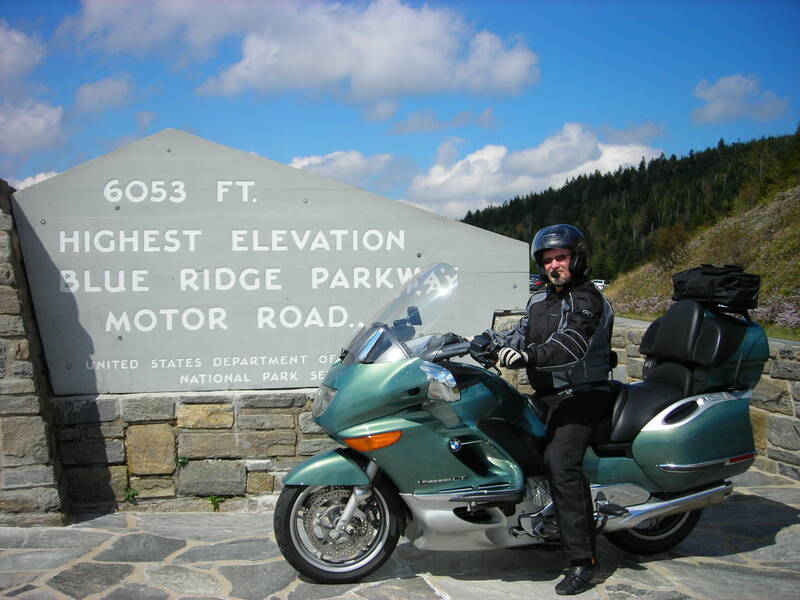 The Blue Ridge Parkway is a trip every motorcyclist should make if they ever get the chance. There’s even a term for people who take a trip like ours: End-to-Enders. I’ll be going through the pictures we took and will put together a slide show that I’ll put in a blog post that will be coming soon. Yesterday afternoon we got back home from our Blue Ridge Parkway Trip and are now what they call “End-To-Enders”, meaning we have traveled the Blue Ridge Parkway from one end to the other. Our trip totaled 1,394 miles, 469 miles (and a bit more because of a parkway detour) were the Blue Ridge Parkway. As we get settled in and get pictures organized I’ll write a post about the trip. Hopefully I can get Donna to write one about the trip from the back seat of a motorcycle. It was a great trip! The only negative part I can think of was that we both got colds along the way. Look for a post soon about the whole trip. Boy did we have some rain overnight in Little Switzerland! The Asheville TV station was talking about it. We spent 2 days taking it easy in Little Switzerland where rode the Diamondback, sat on the porch watching the parkway go by and going across the grounds to look at the mountains. The Big Lynn Lodge was a great place to stay and we want to go back. Last night’s rain became this morning’s thick fog for our departure. After a bit of time in the fog, rain was added. Finally, we got to blue skies by the time we got to Mt. Pisgah. Now that we’re further south in North Carolina the leaf changes are more noticeable and it’s not as green as it was in Virginia. The higher altitudes along with lower overnight temperatures are the reason for that. North Carolina also has a lot more tunnels. We stopped at the highest point on the parkway for some photographs and to speak with some other motorcyclists. From the high point it was on to Maggie Valley for the night. Tomorrow morning we’ll finish up the Blue Ridge Parkway at its end point in Cherokee, NC and head for home. We woke to rain in Hillsville for our journey on the Blue Ridge Parkway to Little Switzerland where we’ll be staying for two nights. The rain let up for us to leave and started again while we were on the road. Once again the good riding gear was worth it, keeping us dry. Even with the rain and fog the views along the parkway can be breathtaking. Once we got to Blowing Rock, North Carolina we even notice a definite change of more fall color in the leaves. We wanted to get some photos of the Linn Cove viaduct but it was too foggy to see it. We stopped at the viaduct visitor center and went to the overlook and took pictures from underneath. We got to the Big Lynn Lodge in Little Switzerland and about a half hour after we did, it started pouring rain again! It’s sunny now though. It seems we’ve had the Blue Ridge Parkway pretty much to ourselves but everyone tells us that will be ending next week. Days one and two on the Blue Ridge Parkway have been done. We got up to mile marker zero and were greeted by heavy fog. It was fog so thick that so you couldn’t see from one end of the scenic overlook to the other! So it was slow going for a while. This fog was so thick it coated everything with a layer of water. Good quality riding gear that is also waterproof has really paid off this trip. We were headed for the Peaks Of Otter Lodge at mile marker 86 where we had reservations for the night. The Peaks Of Otter Lodge was fantastic. Every room overlooks the lake and has balcony or patio. We were on the second floor and had great view from the balcony. The fog was still heavy in the area but did make for some nice scenery. And yes, there really are otters in the lake. The rooms even have screen doors on them. If we ever do this trip again we’ll plan more than one night here because it’s so nice and quiet. The rooms have no televisions or phones and cell phone coverage was VERY spotty at best. The only road is the Blue Ridge Parkway so it’s very quiet. Along the way to the lodge, Donna saw a coyote standing on the side of the road just watching traffic go by. After a night’s rest it was time for a hearty breakfast at the lodge and hit the parkway again. Day two was cloudy and the gog rolled back in. But today the fog wasn’t as heavy or wet. In fact we got away with wearing armored riding jeans instead of the Tourmaster pants. We stopped at quite a few scenic overlooks today because the weather was better. We headed on down the parkway and had lunch at the Mabry Mill Restaurant which is one of the few restaurants that is actually on the Blue Ridge Parkway. We chatted with som Harley riders before eating and then looked at the still working mill before heading on. The new GPS really worked out well today too. As we wer coming up on a mile marker where we could get off the parkway for gas I simply punched in for it to find the nearest gas. About 8 miles later we had a full tank of gas. When we were getting back on the parkway Donna said it looked like there was a new Marathon station! Hey, but it’s about riding. When we were in the Roanoke area we noticed how close civilization was to the parkway. There were even subdivisions with backyards that backed up to the Blue Ridge Parkway. We got off the parkway to spend the night here in Hillsville, VA and in the morning will be getting back on the Blue Ridge Parkway and heading for Little Switzerland, NC where we’ll spend two days. I’ve put a foggy picture with this post. We got started on our Blue Ridge Parkway trip this morning in the rain. It rained on us all the way up to Jasper and then on an off all the way until nearly Asheville, NC. Luckily it was a light rain and not thunderstorms. Riding in the rain isn’t bad if you dress for it. On U.S. Highway 64 (Smokey Mountain Expressway) we hit a crow! It was dining on something in the road and as we approached it took off and flew right in front of us. We hit it while going about 60. No damage, just some “stuff” on the front of the fairing where it hit. The crow flew off to the side of the road. The new luggage made to fit inside the cases let us pack a lot of stuff. You fill the bag full and it fits right in. With the bags we had used it was enough for a long weekend. We packed everything we needed for a week and still didn’t fill the top case bag and use the luggage rack bag for jacket liners and light stuff. We’re spending the night in Christiansburg, VA and will get to the beginning of the Blue Ridge Parkway late tomorrow morning. Tomorrow night we’ll be at the Peaks Of Otter lodge right on the parkway. It’s one of only three National Park Service lodges right on the parkway. The lodge has no televisions or phones in the rooms. The web site even says there is no cell phone service in the area. I guess we’ll see if Verizon Wireless has encroached on that serenity. I finished making our hotel and lodge reservations for our Blue Ridge Parkway motorcycle trip in September. Some of the places were beginning to fill up fast for that time of year. I found it interesting that all the hotel & travel booking sites on television and the internet all boast that they have the lowest rates. But instead, at a few locations I got a better rate by going straight to the motel company’s website and booking there! Well one of the things we bought the K1200LT for was taking trips on it. Well now that I’m retired it’s time for a trip somewhere on the motorcycle. And not the kind where you ride for a day, stay the night and come home or where we ride to a relative’s house and stay. We’re thinking a good old-fashioned load up the motorcycle and take a motorcycle vacation. We’re considering a combination retirement trip and second honeymoon trip from the northern end of the Blue Ridge Parkway to the southern end sometime this fall before the leaves start changing and the hotel rates go through the roof.